Today we will work on old kitchen cabinet. 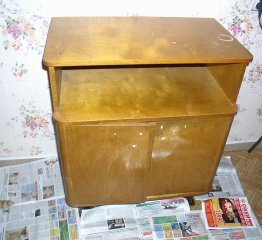 Take a look on picture "before"
paints, brushes and all painting stuff if you plan to draw something on the cabinet. Step 1. Wash the cabinet. Sand it a little bit if it has a lot of old finish on it. Step 2. Cover it using acrylic base. Let it to dry. Step 3. Time for decoupage. Cut out pictures you like. If you plan to cover all surface of sides and top the best source of pictures is wallpapers. Step 4. 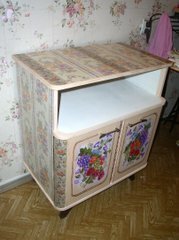 Apply a layer of decoupage medium (or decoupage glue or just multipurpose glue*) on one side of cabinet. If you want you can apply a layer of glue also on back of wallpapers. *Note - if you going to use regular multipurpose glue add some water to it. It should be not to thick. Step 5. Stick the wallpapers on the glue. Push down the picture, for big picture start from center. Your goal - no wrinkles or air bubbles. You can also put the glue or decoupage medium on the top of the wallpapers. Let it completely dry. Step 6. Repeat steps 3-5 for all sides and areas of your cabinet you want to have pictures on. Let it dry completely. Step 7. 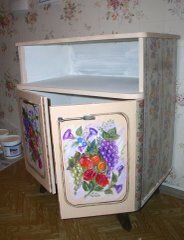 It's time to add your drawing to your already unique and good looking cabinet. Also you can stick the smaller pictures using the same way we used for sticking wallpapers. Step 8. Apply layer of water based finish on cabinet. Do not use any other type of finish - you can have spots looking like spots of grease if you use any other type of varnish or finish. If needed apply couple layers (3 is more than enough) Let each layer dry before putting next one. This is amazing! And the hangers are awesome! 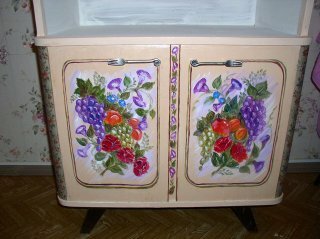 I design vintage inspired clothing, so I really have a great respect for your projects...wish I could refurnish things like this! Thanks a lot. Glad that you like my works and art creation of really talented peoples who's art I am trying to show to anybody. OMG! It's just awesome! really cute! Great work, friend!